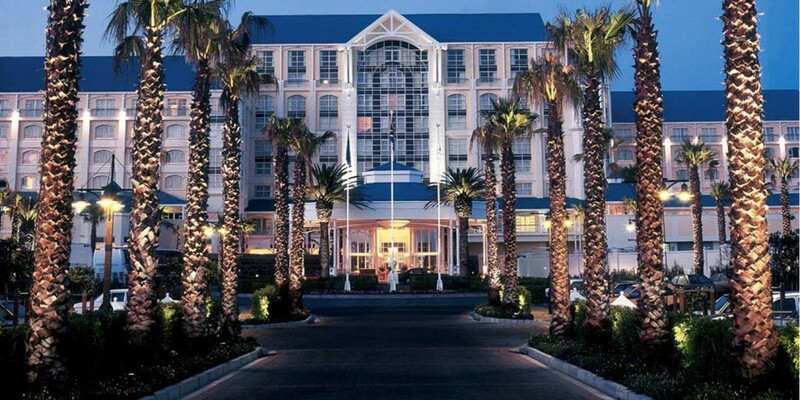 The Table Bay hotel, which is interlinked to the bustling V&A Waterfront is an absolute feast for the eyes. The rich architecture, high ceiling and mind-blowingly large chandeliers of the Lounge play host for the high tea while the plush seating and a cosy environment overlooking the harbour and Table Mountain makes you want to nestle deeper into your chair and spend a good few hours tasting everything in sight. The 3 course meal option, which is the one we opted for, saw us being treated to a selection of around 29 different TWG tea’s. We paired our first course with a Crème Caramel and French Earl Grey which arrived in large pots enough for 2 or 3 servings each. The very first course, which is served at the table is a delightful combination of 2 green pea and potato samosa’s, 2 chicken spring roll’s and 2 smoked salmon and watercress quiche which are accompanied by house smoked and cured ostrich on bruschetta with pickled dune spinach relish, a chargrilled garlic and lime marinated eggplant in mini roti with curry leaf salsa and chilli mayo, fresh julienne vegetables and peri-peri chicken with mint wrapped in rice paper and coriander chutney and fresh franschhoek trout with turmeric mayo on spinach bread. All in all the first course was quite lovely. I did however find the samoosa’s too spicy and the quiche a tad bit too salty which was a pity as the filling was absolutely smooth and creamy and the base perfectly baked. The spring rolls however were utterly delicious along with the cured ostrich on bruschetta and eggplant roti (I am such an Indian!). For our second course, which is also served at the table, we opted for cuppachino’s which were brewed beautifully and had a strong, distinct flavour. The scones and chocolate chip rock buns which are brought out with lemon curd, clotted cream and two home-made jams were utterly delightful and made us feel like little kids as we dipped them in the sweetened coffee. Both the scones and rock buns were soft and, when paired with the lemon curd, absolutely delicious and tangy. After our second course we took some time before making our way to the buffet table stacked with desserts of different kinds and chose Moroccan Mint and Green Tea to act as a counterbalance between the courses which- to be completely honest, was a pretty darn good choice. The breathtaking dessert table was a feast for the eye just as much as it was for our bellies and, even though we wanted to sample every single thing on offer, we simply couldn’t. The selection of sweet treats include carrot cupcakes, chocolate almond cake, mini gateaux opera, lemon and granadilla meringue tart, the ever popular green tea and vanilla swiss rolls, chocolate and Nutella spread éclairs, saffron and cardamom crème brulee, lemon and poppy seed medallions, salted caramel crisp pearls chocolate tart, macaroons, chocolate truffles, cream fraiche pound cake, savarin aux fruits, coffee tiramisu, chocolate and orange mousse cups, rooibos cream caramel panacotta and finally, a cheese board. And, if that intense menu doesn’t quite satisfy your cravings, there is also a selection of cakes such as the rainbow baked cheese cake, milk chocolate, coffee and praline cake, passionfruit and pistachio cream cake and the red velvet cake. They also have a selection of candies and sweets available for children to pick and choose as they like which, as I can imagine, must be a true gift for parents who want to unwind. We tried a selection of a few things such as the coffee tiramisu, chocolate tarts, the red velvet cake, some sweets and a lemon cake which were all absolutely lovely. My favourite of the lot however was the coffee tiramisu and if I wasn’t so stuffed, I would probably have polished that entire tray! All in all the experience was utterly lovely and the staff were such a pleasure. We thoroughly enjoyed the laid back yet sophisticated aura and wanted to nestle ourselves deep within the comfortable seating and stay there forever. What I loved most was that everything was completely halaal which is quite rare nowadays. If you are not keen to do the entire three course meal which costs R220 per person, then you can opt for the ‘Sinful Delight’ offer which encompasses the dessert buffet and one tea at R110 per person. Lovely post 🙂 Must’ve been the most satisfying food baby ever.